How nice it was to reunite with Harry again. One of the most spectacular things about the prior novels was Harry's voice, which stayed with me after I finished. So reading this new story as a play took some adjustment. I did enjoy it, but a script only tells half a story. I couldn't see inside any of the characters. If Harry or Albus acted like jerks, I couldn't understand why. If I saw the actual production I would have felt complete. I would be able to pick up on nuance and see the story come to life. The novels did that for me, but I get little from a bare bones script. 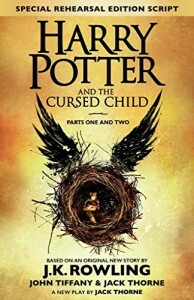 It was nice of Rowling and Thorne to produce something new, but it felt like a little of a cheat to hype this release as a new "book." I will say I loved the scenes with Dumbledore. And the scenes at Cedric's grave. Rowling and Thorne's magic came through. If only I could have watched this live.